While I'm not so sure about the floor scrubbing, I do see the wisdom of battling the blues (in my case the winter blues) with some homemade orange marmalade. The process makes the whole house smell divine, and the delicious end product is perfect spread across a slice of homemade toast or mixed into a glaze for ham. A tablespoon could even be folded into whipped butter to use as a spread. This recipe from Put 'em Up! by Sherri Brooks Vinton will help bring a little sunshine and citrus to your winter. Alter the flavor to suit your fancy by adding a few cloves or a few tablespoons of grated ginger to the final boil. 1. Scrub the oranges, and remove and discard a small slice from each end. Cut the oranges into quarters and remove any seeds, then slice very thinly and place in a medium nonreactive saucepan. Pour the water over the orange slices, and press down on the fruit to release some of its juice. Cover the pan with a tea towel, and set aside on your counter overnight. 2. The next day, bring the mixture to a boil, then simmer until the rinds are tender, about 30 minutes. Cool, cover, and set aside at room temperature again. 3. On the third day measure the cooled mixture and return it to the saucepan with an equal amount of sugar and the cloves, if using. Bring to a boil and cook, stirring frequently, until the marmalade gels, about 30 minutes. Let cool for about 5 minutes, stirring occasionally to release air bubbles. Skim off any foam, and discard cloves. Can: Use the boiling-water method. Ladle into clean, hot 4-ounce or half-pint canning jars, leaving 1/4 inch of headspace. Release trapped air. Wipe the rims clean; center lids on the jars, and screw on jar bands. Process for 10 minutes. 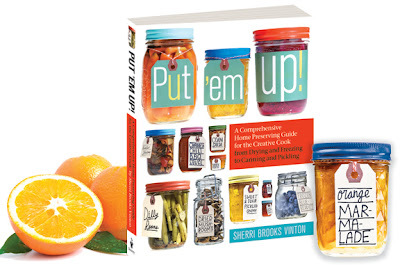 Turn off heat, remove canner lid, and let jars rest in the water for 5 minutes. Remove jars, and set aside for 24 hours. Check seals, then store in a cool, dark place for up to 1 year.